Your Tampines Neighbour. Converting transactions into relationships. A referral from you is the highest compliment we can receive. Read what our previous clients-turned-friends have to say about our services and how they have been referring their relatives and friends for the solutions and value only professionals like us can provide. As we count our blessings on having this new and blessed home, we count ourselves extremely lucky for all the support given to us by Paul & Noena de Leon. They were very helpful and very reliable in answering all our queries. 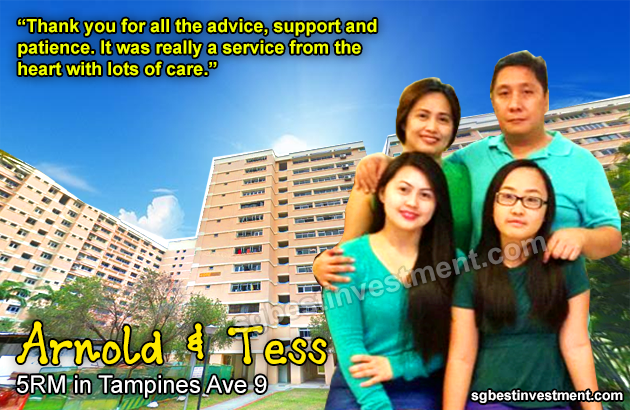 They were also very efficient, thus, they made all transactions very easy for us… Thank you for the dedication and effort while we are looking for this new HDB , now we are on our first year this November 15, 2015. Thank you so much. As our property agent, you two were the best. Very reliable even after the sales transaction was concluded. You guys were the best because we managed to get the flat that we wanted. 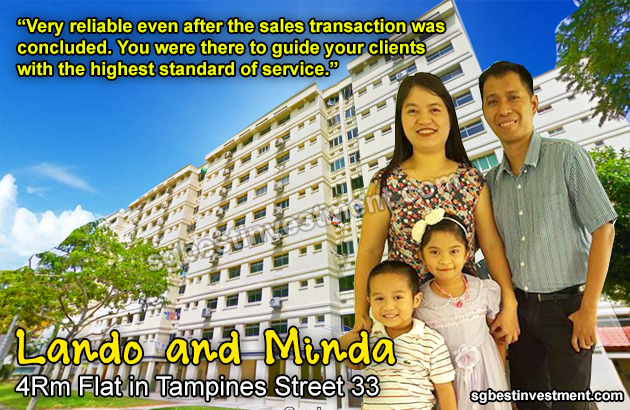 You two were there to guide your clients with the highest standard of service. Our most recommended real estate agents. Thank you, Paul and Noena! 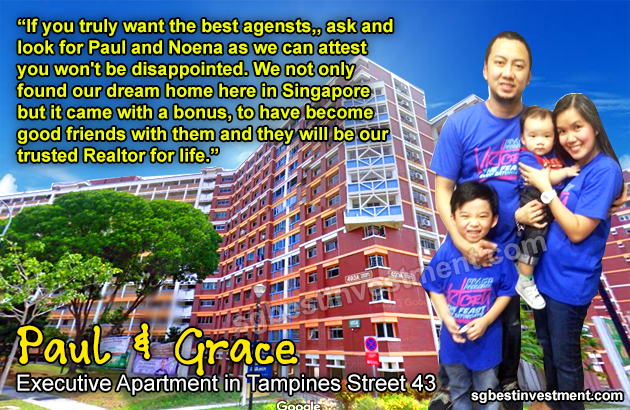 Moving from Toa Payoh to Tampines was a big decision for our family. We were so used to the convenience of Toa Payoh that the thought of leaving is too remote for us. 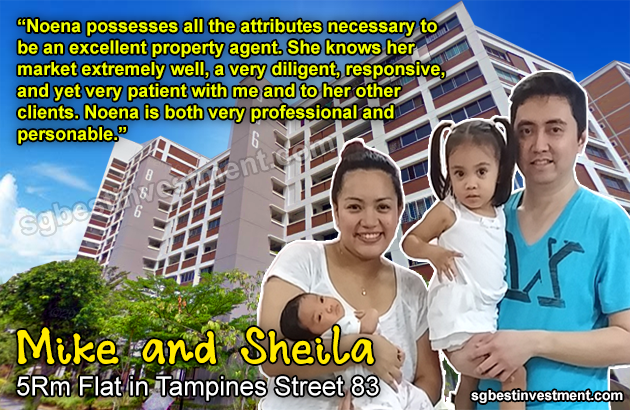 Noena showed us a different perspective that made my husband and I feel confident that making Tampines our home is the right decision. Your deep knowledge of Tampines as well as its future developments are spot on. We couldn’t be happier! Thank you Paul and Noena for showing us that it is indeed possible to own our dream home in a great neighbourhood. I am writing to give Noena de Leon my highest recommendation. Noena possesses all the attributes necessary to be an excellent property agent. She knows her market extremely well, a very diligent, responsive, and yet very patient with me and to her other clients. Noena is both very professional and personable. She clearly takes pride in doing a good job. In my particular case, I had a small conflict with my landlord regarding rental policies and lease contract, we are glad Noena is around to smoothen some rough spots and provided us legal alternatives to solve the problem. We would like to thank you for the great job you did for my family. 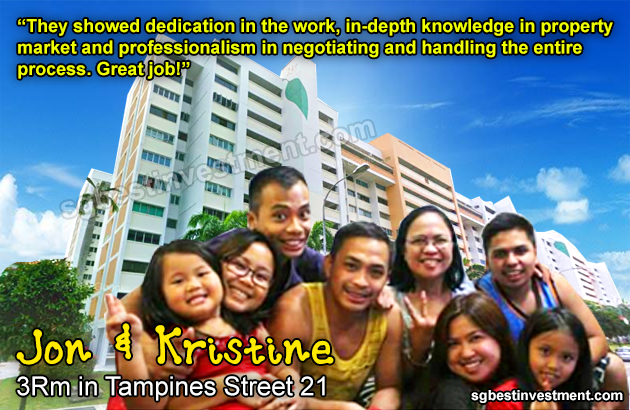 You worked tirelessly for us and did more than any Property Agent has ever done in providing assistance for our new home in Tampines central. My family is very grateful for your help & support to have our decent home here in Singapore. Without your advice & encouragement, we are probably still renting a flat up to now. You’re indeed a blessing to us. More power to the husband & wife team of Paul and Noena. It has been a great experience with Noena and Paul as our agents. They are very nice and caring. They showed dedication in the work, in-depth knowledge in property market and professionalism in negotiating and handling the entire process. Great job! There are a lot of housing agents here and all of them have their own clientele, their own territories, and their own expertise. They can help you look for a flat to rent or buy, and also help you sell your flat if you are looking out to sell it. 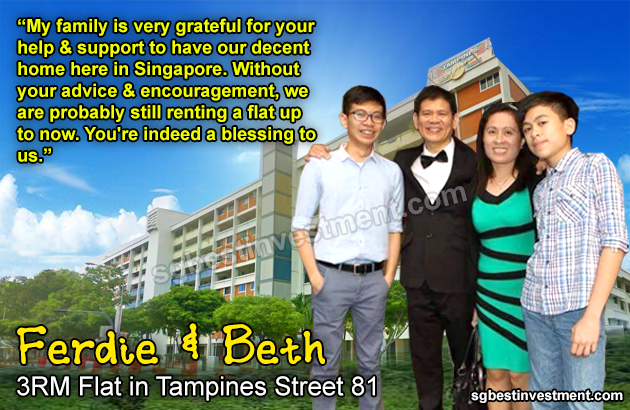 When it was time for us to relocate and have to sell our flat urgently, one housing agent in Tampines stood out among the rest who have offered to help. She moved like a seasoned veteran in the real estate industry in Singapore and was able to help us close a deal in less than 2 weeks! Our previous agent marketed our flat for more than 6 months without any viewing. I can’t help but be impressed. Her name is Noena de Leon. For your housing sales and rental needs, please do not hesitate to approach her. She can be contacted at +65 81804135. You won’t regret it. First of all, it’s hard to have a “good” experience when purchasing a house, it’s just not set up for enjoyment and adrenaline rush as we’ve never bought a house before and weren’t sure what to expect. Before choosing a real estate agent, we conducted a lot of research to see which location and who would be the best choice based on the investment they make into selling the property. The Dennis Wee Group (DWG) stood out as our best Singapore Real Estate Team has to offer given their organic rankings are excellent, their social media presence was strong, and we could tell they put a lot of work into their listings. After looking back at the deal, the negotiations, home inspections, repair request list, helping communicate to lenders, getting us to closing on our dream home, we realized we could not have done this alone. At that moment, we deeply understood the importance of having a great agent and considered ourselves blessed to have Paul and Noena as our Realtors. If you want results, we strongly recommend using the DWG Real Estate Team. If you truly want the best agensts,, ask and look for Paul and Noena as we can attest you won’t be disappointed. We not only found our dream home here in Singapore but it came with a bonus, to have become good friends with them and they will be our trusted Realtor for life. And most especially, something rare to find in an agent is the after support that they are doing to their client. First hand experience, even though the transaction of our dream house completed 2 years ago but still if we have question or anything we need they are still there to help and very much approachable. When we first entered this house, we knew that this is the one. Thank you for all the advice, support and patience. It was really a service from the heart with lots of care. Thanks Paul and Noena. For more client testimonials and feedbacks, give us a call. 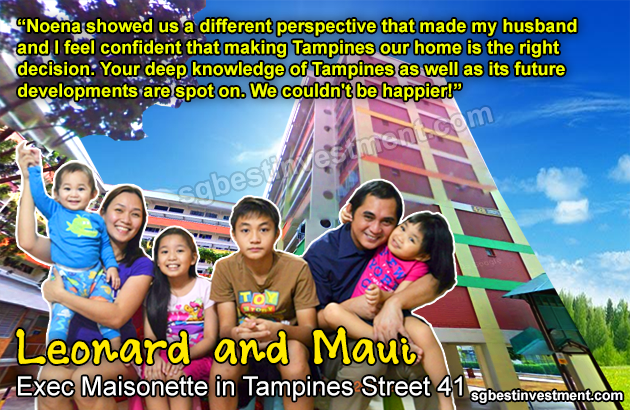 These Tampines current and former residents are more than willing to share their experiences with you.